Internet searches reflect vaping's surge - and money was paid to discover this? Good grief. Researchers at the San Diego State University and the University of North Carolina have been studying internet searches on vaping. I would actually find this interesting if they had attempted to learn something from the trends and find new insights, but they have just fabricated a cheap and deeply unconvincing scare, and that is based on a wholesale misunderstanding of the subject of their study. Here is the press notice in italics annotated with my comments in dark blue. The Oxford Dictionaries selected “vape”–as in, to smoke from an electronic cigarette–as word of the year in 2014. It turns out that Internet users’ search behavior tells a similar story. Between 2009 and 2015, the number of people in the United States seeking information online about vaping rose dramatically, according to a recent study co-led by San Diego State University Internet health expert John W. Ayers and University of North Carolina tobacco control expert Rebecca S. Williams as a part of the Internet Tobacco Vendors Study. One finding from the story of particular concern to health officials and researchers is that when it comes to vaping, people are by and large searching for information on how and where to get vaping products, not for information on quitting cigarette smoking or the health effects of vaping. Comment: isn’t it obvious that people try to find out about products and buy them? All this shows is that the authors don’t understand how vaping works for public health. It is not a smoking cessation treatment, the users do not identify as patients and they are not treating the vendors like clinics. It works for public health because it is an appealing alternative to smoking for people who like nicotine – it is a consumer product that rivals cigarettes and has grown as a market-based insurgency. It is good that vapers don’t look for health information because most of what they would find is highly misleading and alarmist, designed to deter them from trying this much-safer alternative to smoking. The official and academic sources of information about health and risks are heavily contaminated with poor quality science, misinterpretation and hyperbole – of the type manufactured in San Diego and elsewhere in California. E-cigarettes and other hand-held vaporizers began appearing on American shelves in the mid-2000s. Since then, they’ve quickly risen in popularity while regulators have been slow to adapt smoking legislation to account for these devices. Comment: there is actually no problem for regulators to solve – and regulation of the type envisaged by the FDA is so destructive that it amounts to a form of protection of the cigarette trade. As vaping has risen, the harmful habit of smoking has declined rapidly in both US teenagers and adults, and this is consistent with vaping displacing smoking, and use being concentrated in smokers or people who would otherwise be likely to smoke. See my critique of the arguments of Matt Myers of the Campaign for Tobacco-Free Kids for a simple guide to this. “Big Tobacco has largely taken over the e-cigarette industry. Alongside unchecked marketing and advertising, e-cigarettes have exploded online,” Ayers said. Comment: Show some market share data? There is a massive non-tobacco sector in the more advanced vaping devices. If they had been genuinely curious, then they could have looked at how non-tobacco owned brands compared to tobacco. This is US search data for Kanger (not tobacco-owned, advanced vaping products) and the leading brand of Reynolds and Altria. 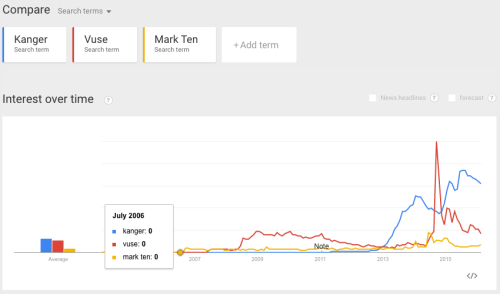 Kanger seems to be doing rather well compared to big tobacco brands. Marketing and advertising of e-cigarettes is subject to the same constraints as other forms of advertising. But it should be realistically understood as anti-smoking advertising, promoting an alternative and technologically superior and much less harmful product. The authors haven’t found the self-critical awareness to consider that such advertising might be beneficial for health, and the more of it and the more powerful it is, the better. 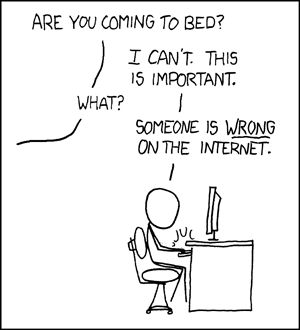 Internet users’ search history bears this out. Ayers, Williams, and a team of colleagues from across the country examined search history from Google Trends, which includes statistics on what specific words people searched for, the search term’s popularity relative to all other concurrent searches in a specified time, date and geographic location. From this data, the researchers can find patterns that point to Internet searchers’ apparent preferences and attitudes. Comment: they got paid for this? The problem here is that they are looking for a problem, but without first showing there is a public health basis for concern. This sort of judgemental patrolling of vapers’ online activity using public money needs a credible rationale to justify it. When they looked at searches related to e-cigarettes starting in 2009, they found a sharply rising trend through 2015 with no end in sight. 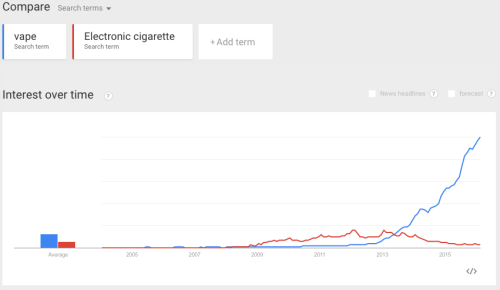 For example, in 2014 there were about 8.5 million e-cigarette-related Google searches. For 2015, their model forecasts an increase in these searchers of about 62-percent. Comment: of course there is a rapid rise – it’s a recently introduced and rapidly growing product category. The same would be found for any new tech gadget. And why should there be an end in sight? The market for vaping products is about 4-5 percent of the tobacco market. If the growth stopped now, public health would have succeeded in protecting the cigarette trade: a national tragedy. These trends may be very positive – a sign that a new technology is making inroads into the cigarette trade. The fact that the authors think this growth is bad is a helpful, if tacit, disclosure of their biases. Looking at geographic data, they found that e-cigarette searches have diffused across the nation, suggesting that e-cigarettes have become a widespread cultural phenomenon in every U.S. state. Over the same time period, searches for e-cigarettes far outpaced other “smoking alternatives” such as snus (smokeless tobacco) or nicotine gum or patches. Comment: of course, because they are alternatives to smoking and smoking is ubiquitous throughout the United States. Vaping is where the smokers are, and smokers are everywhere. How hard can this be? Comment: I hope the AJPH realises this study as about as weighty as a vapour cloud, and will, at least, allow some balancing commentary. Comment: this is because one reason for the success of vaping products is the great diversity allowing users to find products that are just right for them, or to have fun exploring different flavours and devices. For obvious commercial reasons, it is not possible for every corner shop that sells cigarettes to stock the range of devices and e-liquids that smokers are seeking in this market: the diversity is too great and the density of users too low to justify the inventory costs in much of the country. So vapers go online to shop, and suppliers use the internet to concentrate their operations and reach large populations. You don’t see the equivalent internet behaviour for smoking because people are buying smokes in convenience stores, not on the internet. “One of the most surprising findings of this study was that searches for where to buy e-cigarettes outpaced searches about health concerns or smoking cessation,” Williams said. Comment: it’s only a surprise if you have no understanding of vapour products and vaping. All these researchers are doing is revealing their own biases – because they think people should want to look up smoking cessation and health information, they are ‘surprised’ that people who are nothing like them don’t do the same. Comment: ah yes, the deliberately misleading use of ‘safe’. No one claims they are 100% safe, no one. It just that they are likely to be at least 95% safer than smoking (see discussion here) and this is the relevant knowledge. When will researchers stop pulling this cheap trick and when will they be called out for it by journalists? There’s plenty of evidence of low-risk and effectiveness in terms of people switching from smoking to vaping – it’s there if you want to look for it and understand it (try Public Health England’s evidence review). In fact, she said, searches for e-cigarette safety concerns represented less than 1 percent of e-cigarette searches, and this number has declined over the past two years. A linguistic trend also emerged from the study. The term “vaping” has quickly overtaken “e-cigarettes” as the preferred nomenclature in the United States. That’s important for health officials and researchers to recognize, the team noted. Surveillance of smoking trends is done primarily through surveys and questionnaires, and knowing which terms people use can affect the accuracy of this data. Comment: yes, of course. This is because “vaping” is a more broadly applicable and accurate term than “e-cigarettes” and is more appropriately applied to the 2nd, 3rd and 4th generation vapour, tank and mod products that have grown rapidly in popularity and have also progressively looked less and less like cigarettes. ‘Vaping’ is a behaviour and ‘e-cigarette’ is a device – did I need to point that out? Also, one of the major weapons anti-smoking advocacy groups have is counter-advertising. In the Internet age, advertisers look for specific keywords to target their advertisements. Knowing that more people use the term “vaping” than “e-cig” helps them be more targeted and effective, Ayers said. Comment: why would “anti-smoking advocacy groups” be targeting a non-smoking alternative to cigarettes? Why would they want to stop people doing the sort of things described in these brilliant and moving CASAA testimonials (which these authors should read before they do any more harm)? Effective at what? Effective at persuading people to continue smoking instead of switching to vaping? Comment: half the time public health activists are claiming that ‘e-cigarettes’ are renormalising smoking, so moving away from ‘e-cigarette’ should be a positive thing, yes? But this asserts that ‘they’ve relabeled it‘ as if the authors have discovered some linguistic sharp practice or conspiracy. In fact, it is a better, more accurate description of the product: these products are not at all like cigarettes, and they should not carry the baggage of smoking and cigarettes because they are 1-3 orders of magnitude less harmful. The study was funded by 5R01CA169189-02, RCA173299A, and T32CA009492 from the National Cancer Institute and U.S. Food and Drug Administration Center for Tobacco Products. Comment: a waste of public money and a wasted opportunity to learn something useful. @Hifistud @SaveEcigs @CaeruleanSea @Clive_Bates Low sugar drink for weight loss, running shoes to get fit, Miso soup increase gut flora.FFS! @CaeruleanSea @Clive_Bates What a sickening article!Lies about it being a BT plot,total neglect of benefits.Taxpayer funded propaganda. @Twigolet @vapers @AtelierDanko @CaeruleanSea @Clive_Bates They clearly don't get that ecigs are viewed as consumer products, NOT quit aids. 9 comments to Internet searches reflect vaping’s surge – and money was paid to discover this? but this is a bit misleading. I think even in “public health” you would struggle to get three (!) grants to spend a few hours searching the web. It looks like the authors hold these three larger grants for a wider research agenda, not for this study alone. If you hold a large grant, it is customary (sometimes mandatory) to acknowledge it in every output you produce — no matter whether you actually spent any money on this particular piece. It’s a pity about all the other costs it inflicts on society, notably your and Carl’s opportunity costs having to debunk it. The authors’ own opportunity costs probably don’t count. In theory, they could use their time to produce something useful, in practice I don’t think that’s an option. Recall that Rebecca Williams was the “scientist” who gave us a good laugh with her even grottier “study” on VapeCons (reviewed on Carl’s blog) — she has probably hit her talent barrier with this one. Thank you… very amusing take. Opportunity cost of researchers time = zero. Why people shouldn’t be searching for what they are searching for – Head Rambles. You picked up on the good point, which I missed, about this amounting to them whining that few people are searching out their propaganda, which is good news. You went into some details that argue with their implicit political claims, whereas I went another direction with that and emphasized that using research reports as an excuse to assert unexamined and undefended political opinions, without any analysis, is a problem here and throughout public health. This remains true even if the opinions are defensible — they still should not be there. The only reason this study (and several hundred others) was conducted, written, published by a journal, and then grossly misrepresented in a University press release was because Obama appointees at DHHS (including FDA, CDC, NIH, NIDA) and other government agencies (VA, US military) have spent more than $1 billion to demonize vaping and to lobby for FDA’s Deeming Regulation (that bans >99.9% of nicotine vapor products). But instead of criticizing dozens of US government funded activist researchers and Universities (and US government funded State and local Health Departments) for misrepresenting their own research and lying about vaping, a better solution is to urge and convince members of US Congress to stop funding DHHS’ counterproductive War on Vaping.